Classroom is an important part of teaching in every faculty which should be uninterrupted by other distractions. It should be well illuminated naturally or artificially with sufficient floor space and seating arrangement for students in education fields. Ventilation should be properly provided. All these facilities will make everyone in classroom comfortable and fascinating to pay attention on lectures of teachers. 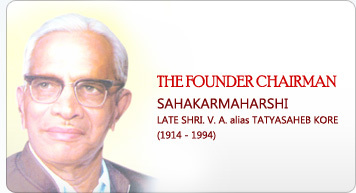 Our college has provided all facilities to student so that they will be comfortable in classroom. 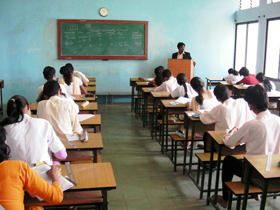 Three classrooms are available in our college. Not only students, teachers should be comfortable during delivery of lectures. 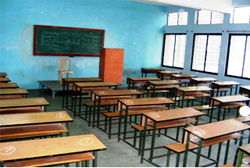 For this purpose, classroom is provided with teacher’s desk. 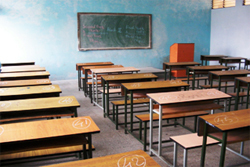 All accessories in classrooms are well organized with seating capacity of nearly 80 students. All classrooms are provided backboard and chalks along with Overhead and LCD projectors for presenting information and images.